SULAWESI ISLAND HAS BEEN HIT BY A 7.5 MAGNITUDE EARTHQUAKE AND A DEVASTATING TSUNAMI, FLATTENING EVERYTHING IN ITS PATH. PLEASE DONATE TO SAVE LIVES IN INDONESIA AND AROUND THE WORLD NOW. On Friday 28 September, the people of Sulawesi looked on in horror as giant waves crashed onto their shores. First the island was hit by a 7.5 magnitude earthquake. Then a tsunami tore through the region, flattening everything in its path and turning thousands of homes to rubble. We’re sending a response team to understand how we can help Sulawesi families who have lost everything. But our resources are limited after an unprecedented stream of disasters this year. Right now, our teams are stretched across the globe, responding to natural disasters in the Philippines and Kenya, as well as operating in Syria, Iraq, the Lake Chad Basin and Somalia. We rely on our incredible supporters to fund our vital work providing shelter in times of disaster. We’re impatient to respond – wherever we’re needed in the world – but we need your help. This is the latest in a series of earthquakes to hit Indonesia. We already have a ShelterBox team on the island of Lombok, helping families recover from the 6.9 magnitude earthquake which hit in August. The team is working with our local Rotary contacts to deliver aid to families in Lombok who lost everything in the quakes. 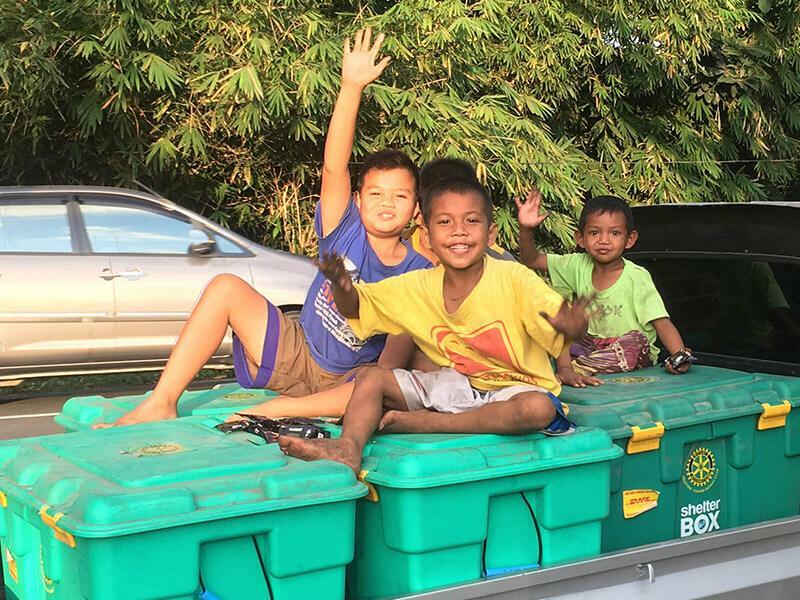 So far we have helped over 360 families across North and West Lombok. Now, in the aftermath of the earthquake and tsunami in Sulawesi, we are hoping to help many more families. We’re sending a highly trained team, whose key focus will be to look at if and how we can best help the families affected. A tsunami is a series of large often catastrophic ocean waves. Tsunamis should not be confused with Tidal Waves, these are waves generated on the surface of the ocean by wind, tidal pull from the moon and the position of the earth. The large waves that form a tsunami happen when there is an earthquake under the ocean. Other things can make tsunamis too, such as volcanic eruptions, sub-marine rockslides or a large impact in the water from an asteroid or meteor. Water will move in all directions from the location of the disturbance, starting small and gradually getting larger and larger. When waves caused by the underwater disturbance reach land, they will be far faster and more powerful than regular ones. They also grow in size as they approach the shallow waters near land. These large, powerful waves can destroy buildings, roads, railways, and pretty much anything else in their path. Tsunamis can destroy whole communities leaving many people homeless and destroying their livelihoods. Clean drinking water will be contaminated and individuals affected often lose their possessions. Liquefaction is a phenomenon which causes sand and soil to act like a liquid when shaken by an earthquake. It tends to happen in places with loose saturated soil, like Palu in Indonesia. The earthquake reduces the strength of the soil and it starts to flow like a liquid, lifting and carrying homes and buildings along with it. The effects can be devastating.